And so it has become time for my first trip as (nearly) a postgraduate. Several train journeys, and a lot of paper reading, later I ended up in the beautiful city of Cardiff for the STFC Summer School in Astronomy. This is essentially a conference for new STFC funded postgraduates in astronomy and space science to come together in one place, have some lectures presented by academics at the top of their fields and nerd out over physics. The week consisted of many different lectures, varying in topic from cosmology to star formation and even a session on the use of Bayesian statistics by the awesome Professor Peter Coles, whom you should all go and follow on Twitter. One of the neat things about this week has been that I’ve been able to meet people other people who are heading into PhDs and find out what they’re working on. Based on what I heard discussed, it’s pretty clear that cosmology and galactic physics are currently dominating much of the effort within the community. This is especially true of cosmology, where a lot of the work in even gravitational wave detection is focussed on detecting tracers of primordial gravitational waves. I also had a very interesting conversation with Professor Don Pollacco discussing careers in academia which gave pause for thought. As well as lectures there were also plenty of other activities to occupy us. On Tuesday morning we had an outreach workshop, in which we were given a topic and had to express it in a group without any spoken words and text using only props. It was quite difficult but the group I was in managed to win it. It probably didn’t hurt that the topic we were assigned was the universality of light scattering due to dust. I have a little bit of experience with that particular topic. 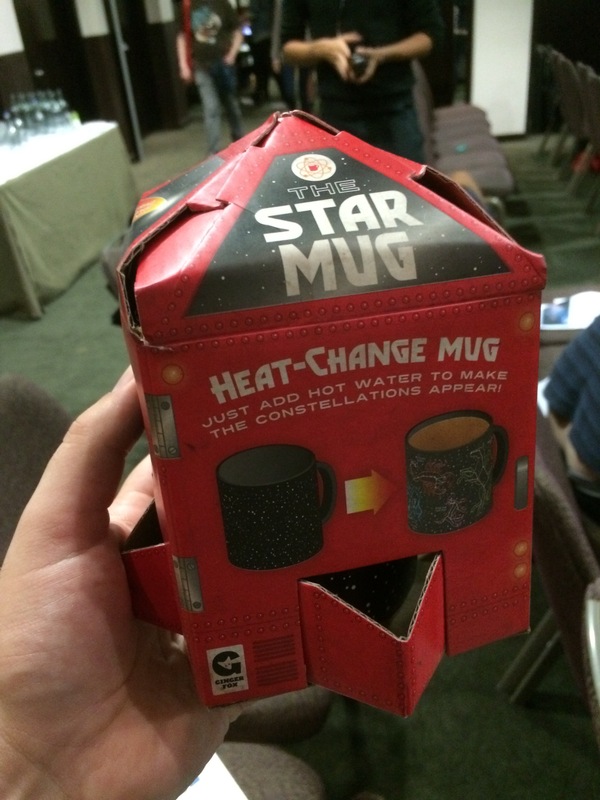 The success of this yielded an awesome astronomically themed mug which shows constellations when you heat it up. I’ll definitely be using that one in the office. The winnings of the outreach workshop. It’s a super cool mug! There was also an awesome trip to Cardiff bay where we visited the Dr. Who experience. The actual experience itself was really good, but I won’t spoil it for you by saying what it’s all about. However, I can reveal that you end up with a pretty awesome view of the Tardis. There was also a really nice tour around Cardiff bay. All in all, a thoroughly enjoyable Wednesday evening. 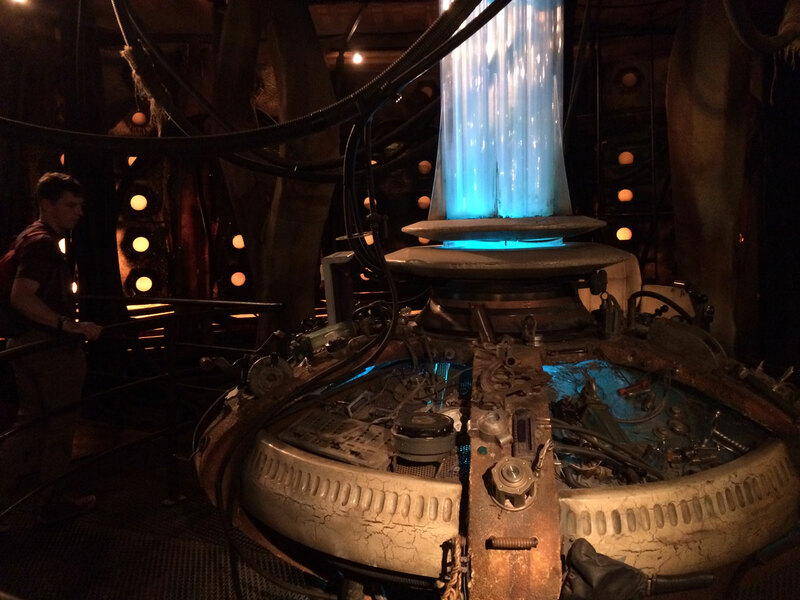 We got a view of the actual old Tardis set in the Dr. Who Experience. There was others chances for socialising, which is the great thing about these events. Throughout the week I made quite a few friends. Among them Dan who is going to be working up in Edinburgh, Peter who you should definitely follow on twitter and Ellen whose going to be working on WEAVE in Oxford, to name but a few. My twitter based commentary of the week was also provided by Daniel, who is also definitely worth a follow. Something which occupied a lot of the attendees all week was the competition in which you had to draw a sketch-note of a lecture. This is basically like taking notes for your average lecture, but instead of dryly taking notes, you instead listen to the lecture and draw, with some kind of explanation and narrative, what your hear. The prize was a plushy Rosetta and Philae, which I thought would make an excellent desk mascot. Based on the prize, I decided that my lecture of choice would be the lecture by Senior Science Advisor for ESA, Mark McCaughrean, entitled Rosetta – Catching a Comet. 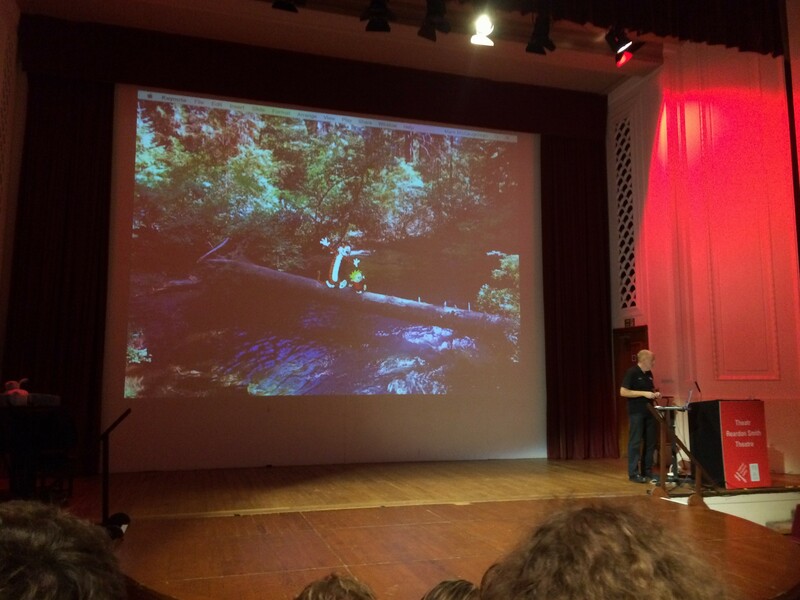 Mark McCaughrean at the presenting a lecture about Rosetta at the National Museum, Cardiff. It was an excellent lecture! The resulting sketch-note was posted to twitter. As you may have guessed from the drawing, I didn’t win. However, I did get an endorsement by Mark McCaughrean himself, which made my day. All in all, I think I can safely say an excellent week was had by everyone attending. Thanks to the amazing organiser of the event, Professor Haley Gomez, and everyone else who was involved in making us feel so welcome in Cardiff all week. 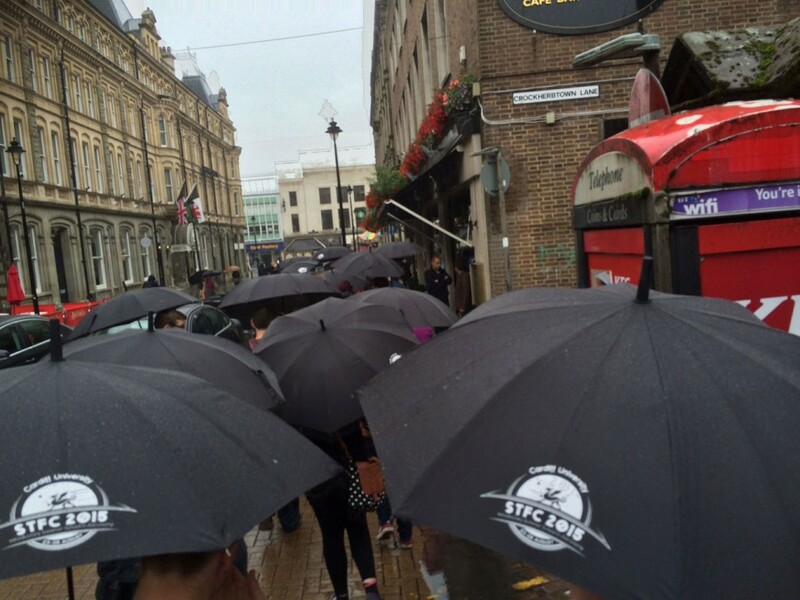 The STFC gave us bags of branded treats, including an umbrella. This initially seemed like a joke gift, but we soon realised why. 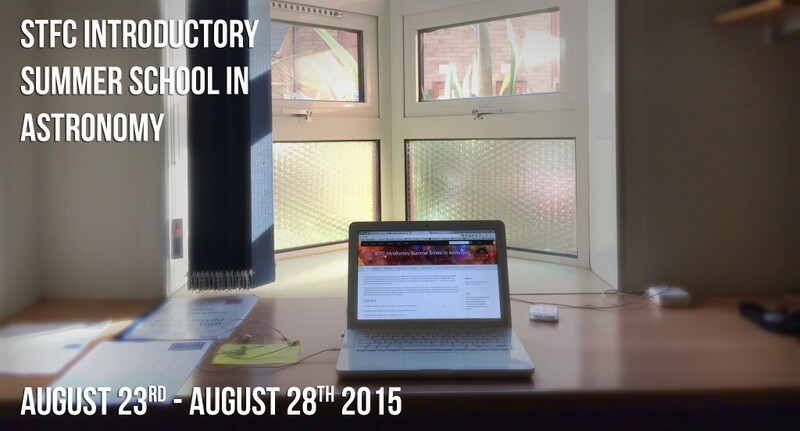 You can see the whole week summarised on a Storify page right over here.